Italian Cinema Today: Interview: Director Dario Carrarini on his Documentary Film "L'eleganza del cibo. Tales about food and fashion"
Interview: Director Dario Carrarini on his Documentary Film "L'eleganza del cibo. Tales about food and fashion"
The trailer for a highly anticipated documentary film was recently presented at the 73rd Venice Film Festival. L'eleganza del cibo. 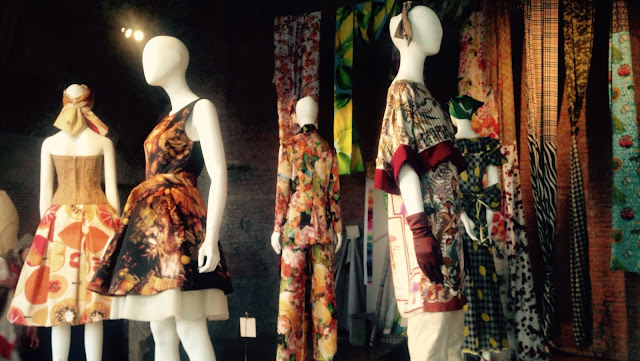 Tales about food and fashion" is the product of an exhibition curated by Stefano Dominella that took place in Rome last year and then hit the road for a tour, which included a stop at the Chelsea Markets in New York City. The focus of both the exhibit and the film is on the relationship between food and fashion with many fashion items taking on a food theme. The exhibit and film also explore the presence and the importance of food in just about every aspect of life, whether the effect is positive or negative. Through clothing, accessories, photographs, videos, holograms, video mapping and visual-art, the creators of the exhibit and film have forged a path, which uncovers the extent to which fashion draws inspiration from nutrition. I had a lot of questions about this unique exhibit and the film it inspired. I contacted the director Dario Carrarini, and was so thrilled by the detailed, thoughtful answers he gave me. Our interview was done in Italian, so both versions are included. 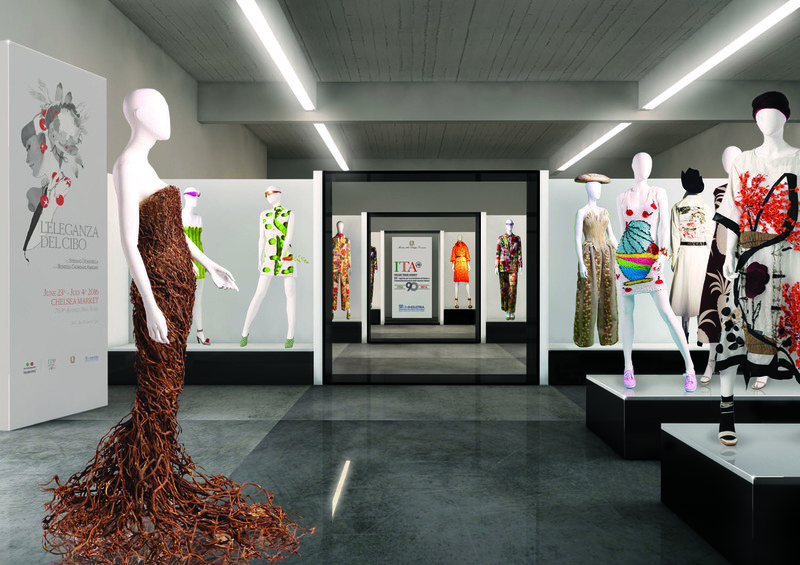 The exhibition by Stefano Dominella is the link between food and fashion, and was the spark from which the project started. Together with screenwriter Paolo Belletti, we collaborated on the exhibition in his first installment in Rome about a year ago. We were all very impressed by the success of this unusual combination, which fused together two cornerstones of Italian excellence: fashion and food. Over the following months, after learning that the exhibition would be held at the Chelsea Market in New York, we began to develop the idea of ​​making a documentary starting right from the theme of the exhibit. Thus came to life the screenplay. The imaginations of Matteo Alfonsi and Paolo Belletti took us on a real contemporary journey, which tells the story of two characters, one male and one female, that starting from opposite poles of the world like New York and Seoul, would deepen their knowledge on the topics of food and fashion, and get to the heart of the stylistic and gastronomic production. Raccontami il tuo film, "L’eleganza del cibo. Tales about food and fashion”. Qual è il legame alla mostra? Per esempio, il film rifletterà il successo il tour della mostra o sarà un documentario su questo tema del cibo e la moda? La mostra di Stefano Dominella che tratta il legame tra cibo e moda è stata la scintilla da cui è partito il progetto. Con Paolo Belletti, autore del film insieme a Stefano Dominella, abbiamo collaborato alla realizzazione della mostra nel suo primo allestimento a Roma circa un anno fa, io come realizzatore di alcuni contributi video esposti e lui come fotografo ed ideatore del catalogo. Siamo rimasti tutti molto impressionati dal successo che ha riscosso questo atipico connubio, che vede fusi insieme due capisaldi dell’ eccellenza Italiana: moda e cibo. Nel corso dei mesi successivi, dopo aver appreso che la mostra sarebbe stata allestita presso il Chelsea Market di New York, cominciammo a sviluppare l’ idea di farne un documentario partendo proprio dal tema della stessa. Così ha preso vita la sceneggiatura curata da Matteo Alfonsi e Paolo Belletti, immaginando un vero e proprio viaggio contemporaneo che racconta il percorso di due protagonisti, uno maschile ed uno femminile, che partendo da poli opposti del mondo come New York e Seoul andranno ad approfondire le loro conoscenze sul tema, fin dentro il cuore della produzione stilistica e gastronomica, un vero e proprio viaggio all’ interno dei distretti del “ saper fare” italiano. Tell me about the shoot, which took place at Chelsea Market. Last June, we started shooting in New York with the protagonist Georgia Tal, who in the first scene of the film is set to review the event at Chelsea Market. There, she meets her editor, played by Alessandro Parrello, who entrusts the difficult task of writing about a mysterious party that will take place in Italy to celebrate the Made in Italy, referred to as the MDI party. Georgia accepts the challenge and travels to Italy, where she will begin her journey to choose the "perfect outfit". But there is more to it. This path will immediately turn into something more introspective and will become her cue to reflect on the current state of things- that of a girl who does not want to imagine herself dispersed in a sea of ​​social networks but rather to bring to light the passion, the tradition, the search of places and especially of people who hide behind what makes us (Italy) famous worldwide. Our film aims to be an act of real reflection on our cultural heritage and a breaking point against the usual "glossy" image from the cover of a magazine. Raccontami il riprese al Chelsea Market. Lo scorso giugno abbiamo cominciato le riprese a New York con la protagonista Georgia Tal, che nella prima scena del film è impegnata a recensire l’evento presso il Chelsea Market. Lì incontra il suo caporedattore, interpretato da Alessandro Parrello, che le affida il difficile compito di scrivere di una misteriosa festa che si svolgerà in Italia per celebrare il made in Italy, il cui nome è MDI party. Georgia accetta la sfida e torna in Italia, dove inizierà il suo viaggio per la scelta dell’ outfit perfetto ma non solo. Il suo percorso si trasformerà fin da subito in qualcosa di più introspettivo e diverrà uno spunto che intende far riflettere sullo stato attuale delle cose: quello di una ragazza che non vuole fermarsi alla sola immagine di se stessa dispersa nel mare dei social network ma che vuole portare alla luce la passione, la tradizione, la ricerca dei luoghi e sopratutto delle persone che si nascondono dietro ciò che ci rende famosi nel mondo. Il nostro film intende essere un atto di riflessione reale sul nostro patrimonio culturale ed un punto di rottura nei confronti della solita immagine“patinata”da copertina. Il titolo è in via di definizione. How did this collaboration between you and Stefano Dominella, the curator of the exhibition, turn into a documentary film? The idea of making a film came from Stefano Dominella. Then Paolo Belletti and I developed a plan to make a documentary feature film. We spoke with KimeraFilm that, fresh from the success of (Claudio) Caligari's "Non essere Cattivo", was quick to come onboard and believed in the project from the beginning. So we decided to begin production on the occasion of the exhibition in New York. I'm also very grateful to ICE (Italian Institute for Foreign Trade) and Dott. Ferdinando Fiore for giving us permission to shoot in New York. We are grateful for their contribution. Questo progetto è una collaborazione tra te e Stefano Dominella, il curator della mostra? L’idea di fare un film è nata da Stefano Dominella, successivamente io e Paolo Belletti ne abbiamo sviluppato l’insieme fino a decidere di farne un lungometraggio dal carattere documentaristico. Ne abbiamo parlato con KimeraFilm che, reduce dal successo di “ Non essere cattivo “ di Caligari, ha creduto da subito nel progetto. Così abbiamo deciso di cominciare la produzione proprio in occasione della mostra a New York. Inoltre ci tengo molto a ringraziare ICE ed il Dott. Ferdinando Fiore per aver permesso la realizzazione di inizio riprese a New York, grazie al proprio contributo. Can you tell me about the filming that took place in New York? Yes, we filmed several scenes that will be the beginning of the film and will alternate with those of the male protagonist (of which I still can not reveal the name) that we will do in the coming months in the East. In the intro, we are presented with the protagonists of the story. We are very happy with the shooting, thanks to the work of the director of photography, Michel Clement-Franco. I found New York welcoming, people were always ready to help with anything. Ours is not a big-budget movie and often in these cases, filmmakers face great difficulty in shooting on location. But the spirit of participation of the people we met was entirely positive. I hope to return soon to film more in New York. Sì, abbiamo girato un intera settima a New York. Abbiamo ripreso varie scene che saranno l’inizio del film e andranno alternate con quelle del protagonista maschile (di cui ancora non posso svelare il nome) che faremo nei prossimi mesi in Oriente. Nell’ intro vengono presentati i protagonisti della storia. Siamo molto soddisfatti del girato grazie soprattutto al lavoro del direttore della fotografia Michel Clement-Franco. Ho trovato New York accogliente, le persone sono sempre pronte ad aiutarti per qualsiasi cosa. Il nostro non è un film ad alto budget e spesso si ha molta difficoltà, in casi come questo, ad affrontare le riprese “fuori casa”. Ma lo spirito di partecipazione delle persone che abbiamo incontrato è stato del tutto positivo. Spero di tornare presto a girare a New York. In your personal opinion, what makes this exhibit, and therefore your film so speical. What is it about this topic that you find so unique. I was very impressed with the exhibition in New York. There was a big audience and I found it fun to watch. I was amazed by the people who came to see it. In the exhibition, there are clothes and jewelry on display that are priceless, and designers such as Gattinoni, Chanel, Valentino, Karl Lagerfeld, Armani and many young designers that reflect the future of Italian fashion. 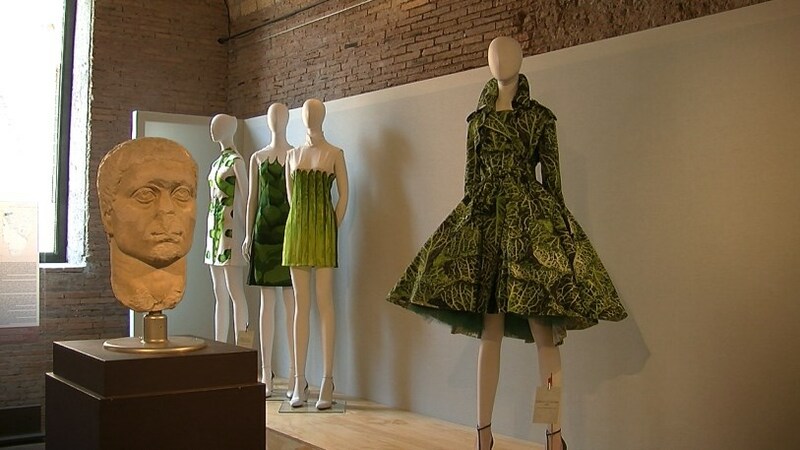 It has been said time and again that it is an exhibition on fashion inspired by the food "that makes you hungry". I think the hunger for culture is never satisfied and that simple things are often the most ingenious, as this project by Stefano Dominella. Quali sono i tuoi pensieri su questa mostra. Secondo te, quali sono le qualità che lo rendono così speciale. La mostra allestita a New York mi ha colpito molto per la grande affluenza di pubblico e ho trovato divertente osservare, quasi di nascosto, lo stupore delle persone che venivano a visitarla. Nella mostra ci sono abiti e gioielli esposti dal valore inestimabile, da Gattinoni a Chanel, passando per Valentino, Karl Lagerfeld, Armani, e tanti giovani designer che riflettono il futuro della moda italiana. Si è detto più volte che è una mostra sulla moda ispirata al cibo “che fa venire fame”, io penso che la fame di cultura non sia mai abbastanza e che le cose semplici spesso sono le più geniali, come questo progetto di Stefano Dominella. When will the film be ready? Will it be shown in theaters or museums? On September 3, we'll present the trailer at the 73rd Venice Film Festival, at the Anica space. The trailer will only cover the initial part with the shooting in New York, since the rest of the process will resume in late September. The idea is to finish the project and present it early next year. The goal is certainly that of a theatrical release, but the idea of making a series for television is the one that interests us most. Quando sarà pronto, sarà mostrato in sala o nei musei? Il prossimo 3 settembre presenteremo il trailer al 37° Festival del Cinema di Venezia , presso lo spazio Anica. Il trailer riguarderà solo la parte iniziale con le riprese di New York, dato che riprenderemo il resto della lavorazione a fine settembre. L’ idea è quella di concludere il progetto e presentarlo all’ inizio del prossimo anno. L’ obiettivo è certamente quello dell’ uscita in sala, ma l’ idea di farne una serie per la tv è quella che ci interessa maggiormente.